As a first step, we will create a new SOA composite with a simple BPEL process that creates a single string response for a single string request. Producing the response takes 5 seconds – because of a Wait activity in the BPEL process. Into this SOA composite, we introduce two BPEL sub processes that together with a Coherence cache act as the shared memory across instances of the composite. 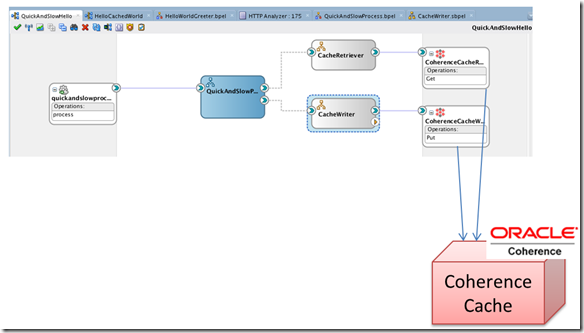 Using Coherence, the sub processes are capable of recording a value associated with a certain key and retrieving a previously registered value. This cache does not just exist across instances of the same SOA composite, it is also available across different SOA composites, across different applications – including Service Bus and custom Java applications – and across cluster nodes. The end result for this section is in QuickAndSlowHello.